499 Beacon is located on the south side of Beacon, between Massachusetts Avenue and Charlesgate East, with 495-497 Beacon to the east and 501 Beacon to the west. 499 Beacon was designed by architect Samuel D. Kelley and built in 1888-1889 by Keening & Strout Brothers, masons, as a four-unit apartment building for Edwin B. Horn, Jr., a jeweler and real estate developer. He is shown as the owner on the original building permit application, dated November 19, 1888, and on the final building inspection report, dated April 12, 1889. Edwin Horn purchased the land for 499 Beacon on November 26, 1888, from Mary Ann (McCurdy) Hall, the wife of Prescott Coburn Hall. She had acquired the land on August 21, 1888, from building contractor Silas Whiton Merrill, who had purchased it on April 18, 1888, from Henry Lee, H. Hollis Hunnewell, and Augustus Lowell. The land was part of a larger parcel that Henry Lee and his partners purchased on February 20, 1883, from a real estate investment trust formed by Grenville T. W. Braman, Henry D. Hyde, and Frank W. Andrews. The parcel was one several tracts of land the trust had purchased from the Boston Water Power Company on March 1, 1872. 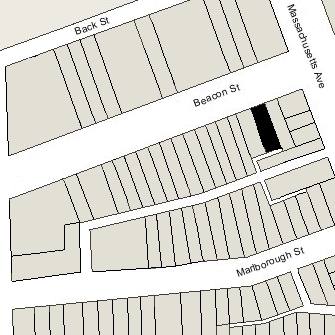 Click here for an index to the deeds for 499 Beacon, and click here for further information on the land west of Massachusetts Avenue between the south side of Beacon and the north side of Commonwealth. On April 25, 1889, 499 Beacon was purchased from Edwin Horn by Joseph A. Jackson, a hat maker and furrier. He lived at 29 Concord Square. He was a widower, his wife, Martha J. (Hutchinson) Jackson, having died in April of 1888. Joseph Jackson died in September of 1894. 499 Beacon was inherited by his four children: William Henry Jackson; Joseph Albert Jackson; Lillian Hutchinson Jackson, the wife of Charles W. Sabine, Jr.; and Ethel Louise Jackson. On December 22, 1897, the Jackson family transferred 499 Beacon to Samuel F. Wilkins, trustee for the benefit of the creditors of the estate of Joseph A. Jackson and for the benefit of the heirs of Joseph A. Jackson. On June 1, 1899, 499 Beacon was acquired from R. Elmer Townsend, successor trustee for the benefit of Joseph A. Jackson’s creditors and heirs, by attorney Godfrey Morse (born Maas). He also owned 495-497 Beacon. Godfrey Morse was unmarried and lived with his brother and sister-in-law, Leopold and Georgiana Louisa (Ray) Morse, at 203 Commonwealth. He married in January of 1907 to Mrs. Janet (Jennie) (Rosenfeld) Conrad, the former wife of Sidney Smith Conrad; after their marriage, they lived at the Hotel Lenox at 61 Exeter. He died in June of 1911. 495-497 Beacon and 499 Beacon continued to be owned by his estate. Jennie Morse married again in April of 1914 to Jacob Joseph Lowe (Lowenburg), a radiologist. He operated the Boston Dental X-Ray Laboratory, and developed and patented a device to use X-Ray technology for fitting shoes to feet. They lived at the Hotel Lenox. On August 17, 1914, Godfrey Morse’s estate transferred 495-497 Beacon and 499 Beacon into Janet Lowe’s name. On May 14, 1925, 495-497 Beacon and 499 Beacon were acquired from Janet Lowe by real estate dealer William N. Ambler. The property changed hands and on September 20, 1926, 499 Beacon was acquired by Dr. John Stanley Harlow, Jr. It continued to be a four-unit apartment building. John Harlow was a physician. He was unmarried and lived in one of the apartments at 499 Beacon and also maintained his medical office there. He previously had been a physician at the US Veterans Hospital in West Roxbury and had lived in Cambridge. On October 15, 1931, 499 Beacon was acquired from John Harlow by his brother-in-law, John Carroll Marble. He and his wife, Roselle (Harlow) Marble, lived in Portland, Maine. Dr. Harlow continued to live and maintain his medical office at 499 Beacon. In March of 1936, John Marble filed for (and subsequently received) permission to convert 499 Beacon from four apartments and doctor’s office to six apartments and a doctors office. On March 4, 1941, John Marble recorded a deed transferring the property back to John Harlow. The deed was dated October 15, 1931, the same day John Marble had acquired the property from his brother-in-law. In January of 1948, John Marble (presumably on behalf of John Harlow) applied for (and subsequently received) permission to increase the number of apartments to seven plus a doctor’s office. 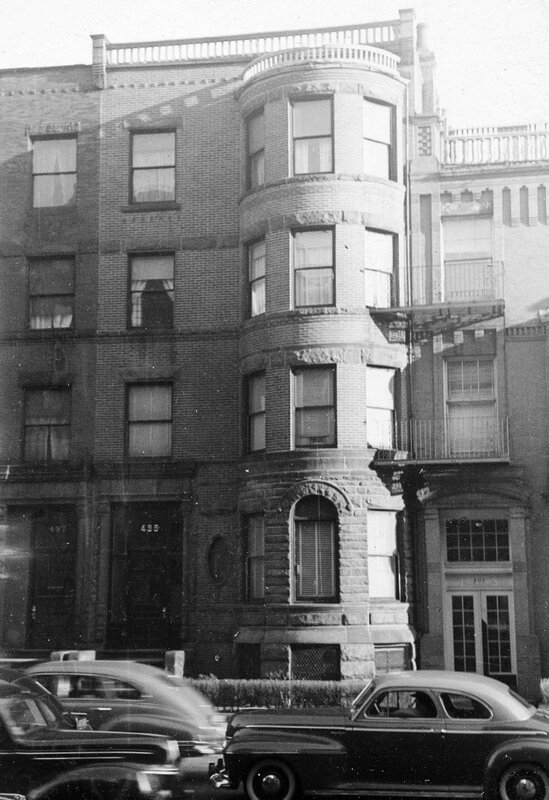 John S. Harlow continued to live at 499 Beacon until his death in January of 1950. 499 Beacon was inherited by Roselle (Harlow) Marble and their sister, Marion (Harlow) Tribou, the wife of Earl Squires Tribou. Roselle (Harlow) Marble died in 1953. On January 26, 1959, Edward M. Juskalian purchased 499 Beacon from Marion (Harlow) Tribou, John Carroll Marble, and the Marbles’ two children, John Carroll Marble, Jr., and Mary Elizabeth (Marble) Green, the wife of Philip Palmer Green, Jr. Edward Juskalian lived in West Medford. On December 14, 1990, Edward Juskalian transferred the property to his wife, Barbara A. (Brooks) Juskalian, and on September 7, 2004, she transferred it back to her husband and to her son, Edward Juskalian, Jr., as trustees of the Juskalian Suffolk Realty Trust. Edward Juskalian, Sr., died in January of 2010. 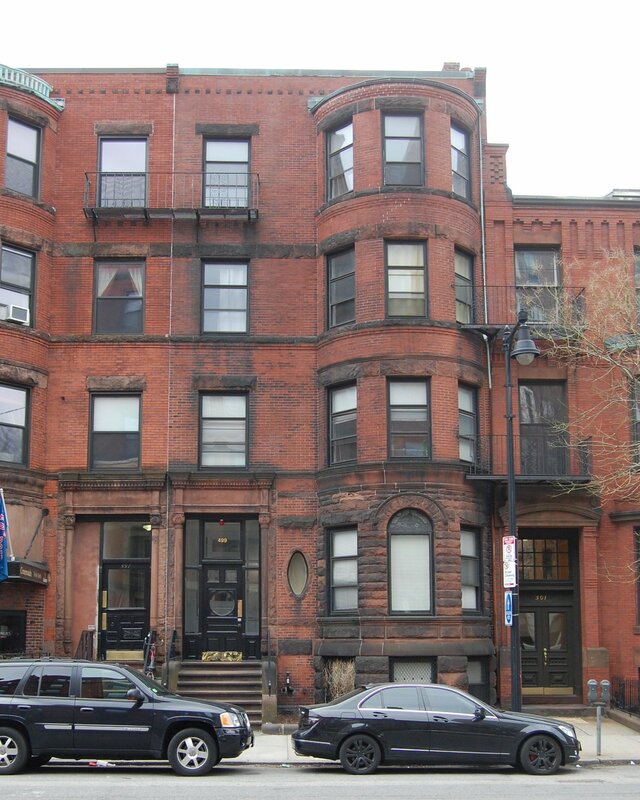 On August 25, 2015, 499 Beacon was purchased from the Juskalian Suffolk Realty Trust by the 499 Beacon Street LLC (The Mount Vernon Company, Inc., manager; Bruce Percelay, president and treasurer). 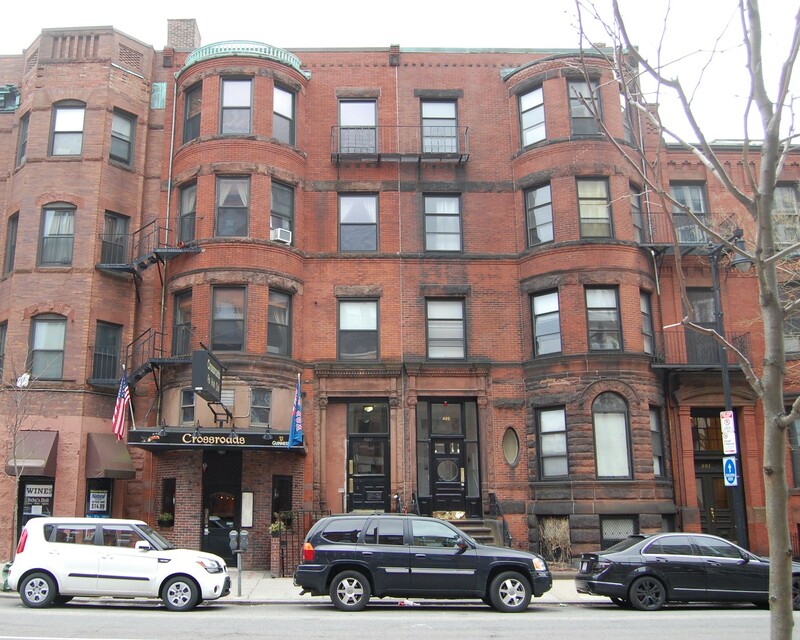 On May 19, 2017, 499 Beacon was purchased from the 499 Beacon Street LLC by the Ledermann US Real Estate Corp.
499 Beacon remained an apartment building in 2018.